The House of Polluce, in the heart of Giurdignano, was built by our forefathers in 1725 as a country seat to manage agricultural production. At the end of the XIX century it became the main family residence until 1960 when the last generation of Polluce decided to move to Bologna, coming back to Giurdignano only during summer holidays. In 1980, the current owner and heir Luigi Polluce – who in the meantime married Patrizia and became father of Francesca – dreamed of recovering the old house where he had been born. Thus “Nostra Signora dei Turchi” appeared, as a tribute to Carmelo Bène, an inspired artist from Salento and fìrst “intellectual romance” of the owner. 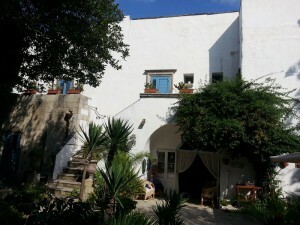 The unique idea was to create a special club in Salento that would offer to his guests a selection of cultural events with prestigious auteur: the “Appuntamenti d’Autore”. The dream carne true and the club climbed from success to success for more than 20 years. Who had the opportunity to share – from 1982 to 2000 – the experience of the concerts of Paolo Conte, Chet Baker, Ray Charles, Michel Petrucciani, Ivano Fossati, Fiorella Mannoia, Patty Pravo, Omelia Vanoni, Gino Paoli – and many other stars of whom the “celebrity gallery” of Nostra Signora dei Turchi is full of- will never forget. Today, after a long and careful restoration, this ancient house that “ne ha viste tante di regine”, is a refiage ready to welcome few travelling companions with whom to share the chance to live “via dalla pazza folla”. Thought more for travellers than tourists, this piace seeks to express emotions and an ambient hard to encounter nowadays, far away from trends: a way to live in peace with oneself like turtles do.